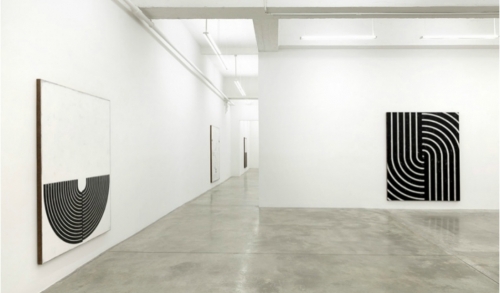 New York’s Tina Kim Gallery is currently showing presenting its first exhibition of Davide Balliano until February 24. The New York-based Italian artist is presenting a body of new large-scale paintings created especially for the exhibition. Continuing his ongoing investigation into perceptions of scale and proportion, specifically in relation to man’s position and status within the universe, Balliano’s monumental yet intricate new works are at once architectural, biological, and mystical, reflecting the variety of sources from which he draws inspiration. Using plaster, gesso, and lacquer, Balliano composes his paintings layer by layer through a process of addition and deletion, ingraining his signature geometric motifs directly into the surface. At a distance the surfaces of his fresco-like minimalist compositions appear slick and uniform, but upon closer inspection are revealed to be highly textural expressions of Balliano’s complex painting technique. Up close the characteristics of the micro supersede the macro, while from afar the characteristics of the macro engulf the micro – the human condition concretized.